The tinsel is hung, the carols are sung. Tchaikovsky’s, The Nutcracker courses merrily in the background and hope hovers amidst every batch of gingerbread cookies. There’s no doubt, Christmas is well and truly upon us. 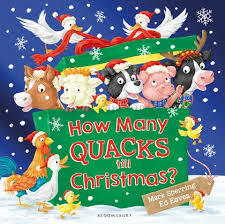 However, if you are still in search of a meaningful Christmas tale to share with your young ones, consider these. They are all full of heart and soul and more than just a little good old-fashioned Christmas magic. If you are ever in need of a little magic, if you ever find yourself questioning reason, if your festive spirit is ever waning, hope is here, with Matt Haig. 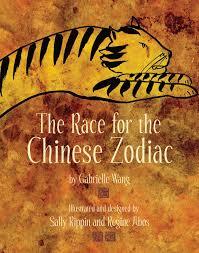 This is superb storytelling for midgrade readers all the way through to 99-year-olds. Following on from Haig and Mould’s first collaboration, A Boy Called Christmas, this tale works so well at suspending belief and infusing hope, you’d be forgiven for feeling you’ve already met Father Christmas. Maybe you have. Haig takes what we have already been led to believe and crystallizes it into one big fat tangible beautiful believable Christmas miracle. Mould’s illustrations enhance an already magical tale with strokes of Dickenson brilliance. A Christmas must read – every year. Sublime to read aloud to little people or to cherish alone as you would the last fruit mince pie. 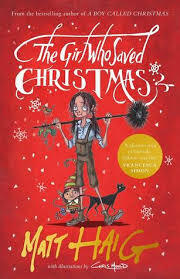 Read, A Boy Called Christmas first to truly fortify your Christmas spirit, then Father Christmas and Me. You’d be forgiven for feeling a little overwhelmed at this time of year by all the demands of the Festive Season, with end of school and social obligations too numerous to count. Time out is as important for your children as it is for you, so why not take a precious moment or two to sit down, relax and share some of these sublime (new) picture books with them to rekindle your Christmas spirit. 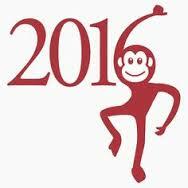 Some of these are so good, they feature in Romi’s roundup of Christmas must reads, too! 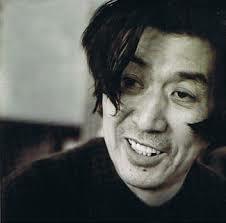 McCartney’s matchless ability to appeal to little readers all over the world is reaching legendary status. 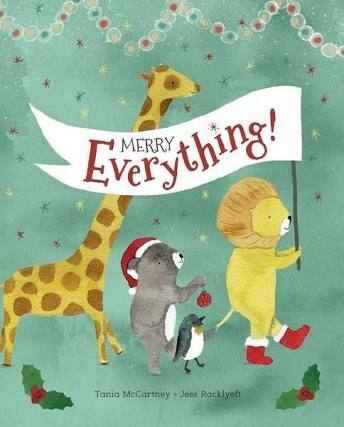 Merry Everything epitomises this in the most deliriously dreamy way using evocative language, occasional merry rhyme and lashings of relatable love as readers reflect on animal families from all over the world hunkering down on Christmas Eve to wait for, you-know-who. It’s the focus on ‘cuddles and kisses’ and all the extraordinary departures from normal at this time of year that I love and young children will recognise and appreciate – fun and games with relatives, gorging on Christmas goodies, and falling into a seasonal stupor afterwards. Racklyeft’s illustrations are sweeter than a plate of choc cherry balls and just as enticing. Love Love Love this. So, you’re torn between traditional sensible titles and contemporary crazy reads to fill your under 12 year-olds’ stockings. Why not splash out on both and please everyone. Here are some more stocking stuffers to complement the rollicking fun ones Romi featured in her Christmas inspired picture book round up. Time to get your Santa on. And what a Santa we have first up. 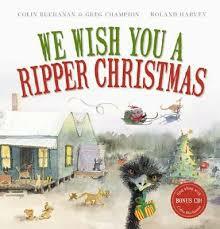 Colin Buchanan and Greg Champion shine again in We Wish You a Ripper Christmas. Sing-a-long to this Aussie bushed inspired slice of summer fun. Santa Wombat is all in a fuddle after losing his delivery list. As he streaks across a burnished outback sky in search of his all-important catalogue for kids, he encounters the bush inhabitants madly making merry in readiness for Christmas day; koalas hanging tinsel, galahs rockin’ on, dingos wrapping thongs – well of course. But will he find his list in time? Choice watercolour illustrations by Roland Harvey, link-arms, sing-a-long tunes included on a CD and a surprise ending make this the perfect picture book gift for international visitors or your own tribe in here in Oz. What does Santa do When it’s not Christmas? 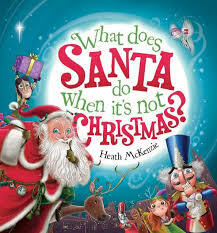 is the question author illustrator Heath McKenzie puzzles in his Chrimbo-themed picture book released last year. McKenzie’s meticulously detailed illustrations glitter with festive cheer long after the last gift is delivered. Readers embark on a thrilling behind the scenes tour of the North Pole like never before where we are privy to the machinations of the Christmas Tree Angel aka gift trendsetter and planner, the Sleigh Pit Crew, the tireless Elves and the grunt and muscle of the Sleigh pulling team aka Santa’s Reindeer. Bubbling with fun and enigmatic suggestions, we never really truly find out exactly what Santa gets up to but can be sure that he’s always somewhere close by. Wink wink, say no more. Highly recommended fun for lower primary schoolers. 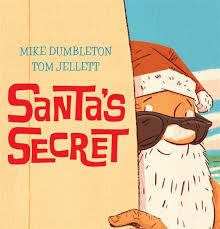 I think Mike Dumbleton and Tom Jellett may have uncovered the truth with Santa’s Secret. This splendid little picture book allows Santa one day to recover after a rather intense night of labour (2 billion pit stops no less) before he sets off on a flight to balmier climes. Forsaking fur-trimmed coat and winter jocks for a pair of boardies, straw hat and obligatory Hawaiian shirt – push pineapple if you please! – Santa lobs up at an old Aussie beach shack. He stashes the reindeer round the back, then…gets out, and cuts some cranking waves aka surfs, until the sun sets. True to his nature however, Santa doesn’t just leave with surfboard in hand, oh no. Ho ho ho! 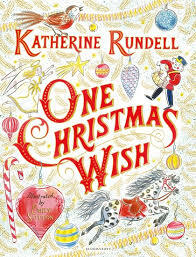 Delectable Aussie flavour ripples throughout this jaunty Christmas tale. You’ll love it and so will the kids. I love jingling my bells at Christmas time, who doesn’t? Claire Saxby and Janine Dawson have given young readers and me all the excuse they need to ‘jingle all the way…’ with Christmas at Grandad’s Farm. 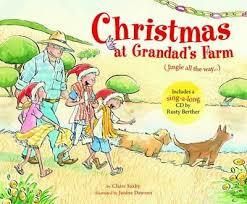 Loud, bold, bouncy rhythmic verse catapults this familiar tune to new heights as we visit Grandad’s Farm for some festive fun. The whole family is there, busting for a swim in the country creek and scoffing the Christmas treats before collapsing in the obligatory heap on the couch. Good old-fashioned Aussie festive fun. Some things never change. Only a CD would make this classic better. Speaking of classics, ever wondered how some of our most endearing Christmas traditions came into being? 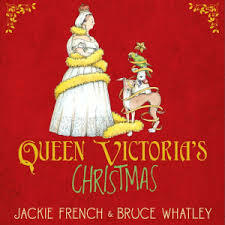 Jackie French and Bruce Whatley’s Queen Vitoria’s Christmas endeavours to disclose a few historical truths in this must-have Christmas classic. Portrayed from the royal canines’ point of view in loping verse and muzzle-high perspective, the mysterious behind door going ons in the palace home of Queen Vic and Al and their five children are eventually explained but more mystery ensues following the disappearance of the Christmas turkey. Jolly and droll, this is history served up with all the best bits included. 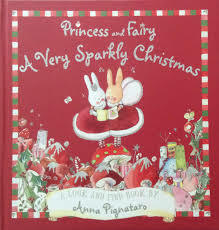 Little readers who revel in sparkles and flickering lights, sugar plum fairies and stars shining bright will adore this look and find book by Anna Pignataro, Princess and Fairy A Very Sparkly Christmas. Festooned with more glitter than a winter wonderland morning this follows the quest of bunny friends, Princess and Fairy. They are paw-deep in pre-noel preparations when they suddenly receive notification from the Keepers of Christmas that they are in charge of decorating the tree this year. 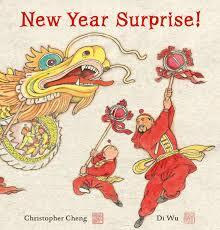 They hop to the challenge in search of the various baubles, treasures, and delights described on their list. And let me tell you, locating these objects so cleverly secreted within Pignataro’s sweeter than sweet illustrations is no sloppy challenge. I’m sure pre-schoolers will have more success than I did and be thoroughly rewarded in glitter and good cheer for their efforts. Crafty, clever, and cute beyond measure, it’ll keep them busy for hours. It did me. 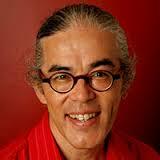 Stick around for Suggestion # 4 where I will introduce you to some hot off the press gift ideas, soon. Check out the Kids’ Reading Guide 2015 – Picture Book lists here, in the meanwhile. And I allow this, for although I normally loathe and despise what I officially term ‘stupid cricket’, with modified rules that you must swing at everything and it’s tips and run, it’s bearable. If I manage to bowl my brother out, I might even term it fun. Admittedly, this tradition comes from an era where water was in greater supply and restrictions didn’t exist and has, due to draconian but necessary Queensland water restrictions, been phased out. For the record (and before you send me chastising emails), there was often more bomb than water, and it was the anticipation of the event and the squealing-fun, hide-and-seek chase that was more important than actually water bombing anyone. This has always been my favourite part of the day. The body’s need to recline and digest the mountains of food it’s ingested lends itself to my two favourite activities: reading and sleeping. The snooze is optional, and there have been plenty of years where I’ve powered through sans nap because the book I’ve obtained is too good to put down. It’s also the part of the day where I no longer appear rude to be off reading a book—my socialising with the extended family has been fully fulfilled and everyone else is doing the same thing. It’s not that I don’t like my family, of course. It’s just that Christmas invariably brings with it some excellent and often highly anticipated (or simply regularly hinted for) books, and it’s difficult for me to tear my eyes away from them once they’re in my hands. But the afternoon reward of reading and napping in turn leads itself to my second favourite part of Christmas Day. It ends with much good-natured debate about the answers to questions, whether something is ‘your final answer’, someone giving hints for those who are struggling, those of us younger ones bemoaning that we weren’t alive when an event happened and that we’re disadvantaged, giving ridiculous responses like ‘Hitler’ when we have no idea, and someone putting the piece of the pie in the wrong way and someone else having to employ surgical-like procedure to dislodge and correctly re-lodge it before the game can continue. In all, it’s a lovely and relaxed way to spend Christmas Day and one that indulges my main interests. It’s also inspires me to read more books to improve my Trivial Pursuit skills. Currently, as the youngest child with fewer years of reading under her belt, I’m the team’s weakest link. This means I’m often paired with my father as a kind of handicap to even out the brainpower. Fortunately, he often still manages to carry me over the trivia line, which means that even though I might contribute the fewest correct answers, I’m more often than not on the winning team. I’ve threatened in recent years to buy a newer, more Gen Y version of Trivial Pursuit (I can’t help but think the reason there are now a variety of themes of the game is because youngest siblings like me got jack of being useless or out of the question loop), but in a lot of ways I’d prefer to read more and expand my general knowledge so I can answer the questions in our existing and fairly old version. So, here’s to a food-, family, stupid cricket-, reading-, napping-, and Trivial Pursuit-filled Christmas, where I will delight in great books and may contribute the odd useful and correct answer. I hope you have a great Christmas too.